has 12 goals and 24 assists in 29 games this season. Joe Thornton knows he’s one of the premier playmakers in the NHL. He knows he has the most points of any player in the past two-plus seasons. He knows the San Jose Sharks not only need, but rely on his ability to create the impossible. He just doesn’t know how he does it. Maybe you’re the NHL’s version of Peyton Manning because you spent years closely watching idols Adam Oates and Pat Lafontaine dish the biscuit in the NHL? “I was always a fan,” Thornton said. Maybe you’re part of the small population that can make that play – you know the one – because of your innate ability to carry the puck deep into the zone, to never turn it over or get lost in the zone? “I won’t give it away until I have a man open,” Thornton quipped. Does the fact that you’re 6-foot-4 and weigh 235 pounds have anything to do with it? Or, maybe – just a thought here, Joe – is it simply all of the above? That’s why those who do appreciate it all the more. 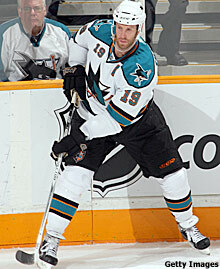 Thornton won the Hart Trophy in 2006 after wracking up 29 goals and 96 assists in 81 games, including 92 points in 58 games with San Jose after an early season trade from Boston. He had 114 points, including 92 assists, last season. So far he has 24 assists and 36 points this season, tying him for ninth in the NHL. But there is more to Thornton than the ability to create a goal where no one else sees one. For instance, there is his devotion to his new hometown. Did you know that Thornton is quite the rink rat? “Last year we couldn’t keep him off the ice,” Wilson said. “He had injuries and we could not stop him from practicing when he shouldn’t have been practicing. Hey, did you know that, too? It’s true, and it easily is the most important element Thornton brings to San Jose. 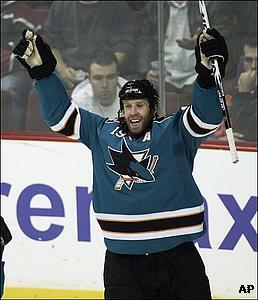 Thornton, the rink rat with the great playmaking ability who loves Northern California, is only 28 years old. There only are a few players in the League – Vincent Lecavalier, Henrik Zetterberg, Danny Briere – in that late-20s age bracket that can say they’re just now coming into the prime of their careers. There are even fewer who play the game the way Thornton does. Thornton can see it, too. He said he feels great and he’s comfortable with everything he’s doing on and off the ice. Since Thornton’s arrival in Silicon Valley, the Sharks haven’t advanced past the Western Conference semifinals. But only eight of the 26 players currently on the Sharks roster have celebrated their 30th birthday. Setoguchi is only 20. Torrey Mitchell, another contributing rookie, is 22. Matt Carle, a defenseman in his second full season, is just 23. What’s more, the core of this team – Thornton, Jonathan Cheechoo, Patrick Marleau, Milan Michalek, Setoguchi, Mitchell, Craig Rivet, Carle and Evgeni Nabokov – is locked into contracts for at least two years, and some many more. Thornton, in fact, extended his stay until at least 2011 by signing a three-year deal in the offseason, when he plans to sign another. “We think our next five years here should be an exciting time,” Wilson said. Thornton undoubtedly will be at the center of it all. Did you know it’s on him to bring the Sharks a Stanley Cup? He does, all too well.